Today, I’ll be talking on the subject FINANCIAL FREEDOM. You’ll notice that I use this term often in some of my articles. I am not ignorant of the fact that many of us do not understand this term and it is for this reason that I have taken out time to explain this term to clear our minds. Before we go further, I want you to understand that financial freedom is not the same as financial independence. As we go further, I’ll differentiate them. WHAT IS FINANCIAL FREEDOM? If I may ask. Financial freedom is a state where you are not bothered or disturbed about your basic needs, a state where you are able to provide comfortably, without any hassle, your daily needs. It is a lifestyle in which you are happy doing what you want, and from it you earn a fortune. And what is FINANCIAL INDEPENDENCE? We can simply say that financial independence is a state of being totally free from dependency, that is, being able to cater for yourself without the help of your guardian, parents etc. You are able to feed, clothe and shelter yourself. NOTE: You cannot achieve financial freedom unless you’re financially independent. 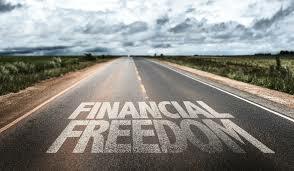 Is FINANCIAL FREEDOM achievable or is it just another fantasy? Now, just come with me, don’t think about the possibility, just flow with the thought. How will it feel when you come back from work, to your exquisitely furnished house, in a very comfortable car, and you’re treated to any meal of your choice, not minding the cost? Not having to pay for rent at the end of each month, year? You have seen it and it looks exactly like one of those Hollywood tricks, right? It is very much achievable by anybody who will be willing to pay the price for such a feat. The challenge we’re facing today is that of the mind. Many have positioned their minds to have a limited vision. The problem here is that when a child walks into a dark room, he is afraid until there is a source of light, but “a man turns back from the light when he is accosted by any with the fear that it is too bright”. Doesn’t seem reasonable right? But, that’s the truth. Many see various ways to improve their lives, but refuse to do so with excuses that “it is not possible”, “you have to be ‘realistic’”, and all that.You can never have true freedom without financial freedom. “A battle is first won in the mind.” If you can’t see it in your mind, you can’t have it in your hand. “You are not permitted to partake in a future you cannot picture”, my lecturer said to me some years back. You have to see the possibility of achieving financial freedom before you embark on its journey, because you might end up stumbling on it but since you never saw it as a possibility, you end up not identifying it. Hence, passing it by. Financial freedom has to do with you having a constant source or flow of income, investments that are functioning properly and yielding returns etc. You have to start small and remain consistent in the small you’re handling, gradually expanding it and looking out for better opportunities to continually increase it. Many people can be like, “I have a JOB. Why should I disturb myself chasing after the shadows?” "You sound like my 7 year old kid." That is not a mentality for someone who wants to achieve financial freedom. Robert Kiyosaki defined “JOB” as “Journey Of the Broke”. It is someone running in a wheel, just like a guinea pig, the worker or person end up struggling harder each day with the target or aim of reaching that “cheese” which is impossible and each day, he ends up repeating the same thing, but also expecting a different result. What will you call that? Let us face the truth here, you can’t live out your dreams by just working on that "my job", you’ll end up earning a salary. Don’t get me wrong, I am not saying getting or having a job is wrong, what I’m saying is that no matter what you do, try to increase your sources of income.When you work on your job, you earn a salary; but when you work on yourself, you earn a fortune. 2. Take control of your cashflow. 3. Know the difference between ‘risk’ and ‘risky’. 4. Decide what kind of investor you want to be. 6. Make disappointment your strength. So before you run off in a quest to achieve financial freedom, understand that you have to first achieve financial independence, get something doing, start with getting a job. You have to start somewhere but don’t remain there. You can check out our take a step corner for some ideas.